Working with students to imagine the human dimensions of climate change has led to a new book, the edited collection Teaching Climate Change in the Humanities (Routledge, 2016), which grew out of one of her graduate seminars. The first textbook of its kind, it also marks the first time LeMenager has produced a book with students, advising coeditors and UO doctoral students Stephen Siperstein and Shane Hall. 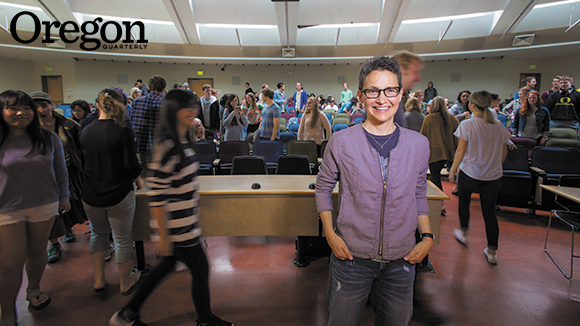 “Endowed faculty positions signal to everyone—students, faculty, alumni—that this is a university that seriously values research and mentoring,” LeMenager says, adding that the visibility of her endowed position helps attract graduate students to work with her and UO colleagues in environmental humanities, extending the school’s reach and influence.